Naturvet Off Limits Training Spray is designed to help keep pets away from desired areas. 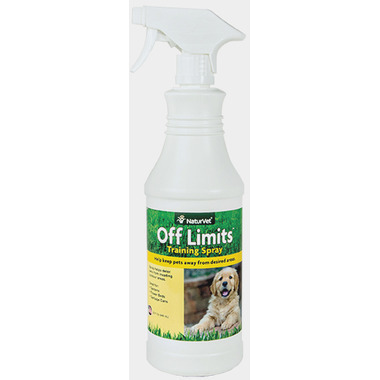 Off Limits is a special combination of herbal extracts that create an invisible shield pets find unpleasant. Inert Ingredients: Total Inerts (99%). Glycerine, Lime, Purified Water, and Sodium Lauryl Sulfate. If spraying on fabric test product on a small inconspicuous surface area before using. Always follow the instructions attached to the label of this product. No for use directly on pets!